Floret Flower | Campo de' Fiori | Naturally mossed terra cotta planters, carved stone, forged iron, cast bronze, distinctive lighting, zinc and more for your home and garden. 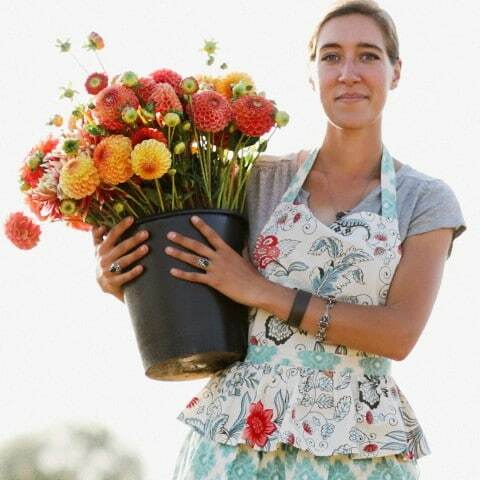 Erin Benzakein is the founder of Floret and the face of the company. Considered one of the nation’s leading “farmer florists,” – a term she has helped popularize to describe those skilled at both flower farming and floral design – Erin is an accomplished photographer, author, teacher, entrepreneur and winner of the 2014 Martha Stewart American Made award for Floral and Event Design. Her exuberance for seasonal flowers has helped spark a local flower renaissance and inspire a new crop of beginner “farmer-florists.” Floral designers and flower farmers from around the world flock to attend Floret’s consistently sold-out workshops where Erin shares her secrets to small scale high intensity flower production and demonstrates her natural floral design techniques. Erin’s first book on flower growing and floral design will be published by Chronicle Books in the fall of 2016.